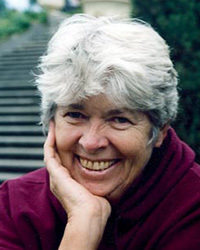 Sandy Boucher, M.A., has practiced, written about, and taught both Vipassana meditation and writing for 35 years. Her books focus particularly on women's contribution to Buddhism and participation in Buddhist institutions. She leads retreats exploring Creativity, the Feminine Divine, and Healing. Her latest book is She Appears! Encounters with Kwan Yin Goddess of Compassion, a compendium of writings and artwork exploring a Western envisioning of the Celestial Bodhisattva of Compassion Kwan Yin.